^ FOTA一致同意一起发布新车 地点定在西班牙瓦伦西亚. 2009年12月11日 （中文）. ^ 2.0 2.1 Elizalde, Pablo. Ferrari unveils 2010 challenger. autosport.com (Haymarket Publications). 2010-01-28 [2010-01-28]. ^ Ferrari to unveil new car on 28 January. autosport.com (Haymarket Publications). 2010-01-13 [2010-01-13]. ^ 4.0 4.1 Elizalde, Pablo. McLaren announces car launch date. autosport.com (Haymarket Publications). 2010-01-14 [2010-01-14]. ^ McLaren to launch car at Vodafone HQ. itv-f1.com (ITV Sport). 2010-01-22 [2010-01-22]. （原始内容存档于2010-01-25）. ^ 6.0 6.1 6.2 Elizalde, Pablo. Renault sets date for R30 launch. autosport.com (Haymarket Publications). 2010-01-14 [2010-01-14]. ^ 7.0 7.1 7.2 Exclusive Peter Sauber Q&A: Ferrari-powered C29 on schedule. formula1.com (Formula One Administration). 2009-11-30 [2009-12-03]. ^ Sauber to launch car on 31 January. autosport.com (Haymarket Publications). 2010-01-06 [2010-01-06]. ^ 9.0 9.1 9.2 Elizalde, Pablo. Mercedes GP unveils car colours. autosport.com (Haymarket Publications). 2010-01-25 [2010-01-25]. ^ 10.0 10.1 10.2 Elizalde, Pablo. Toro Rosso confirms Valencia launch. autosport.com (Haymarket Publications). 2010-01-25 [2010-01-25]. ^ 11.0 11.1 Elizalde, Pablo. Williams 'pleased' with F1 entry. autosport.com (Haymarket Publications). 2009-06-12 [2009-06-12]. ^ Barrichello to test on 1 February in Spain. motorsport.com (GMM). 2010-01-12 [2010-01-12]. （原始内容存档于2011-06-06）. ^ Noble, Jonathan. Virgin aims to earn respect from rivals. autosport.com (Haymarket Publications). 2009-12-15 [2009-12-15]. ^ 14.0 14.1 Virgin to launch car online. autosport.com (Haymarket Publications). 2010-01-29 [2010-01-29]. ^ 15.0 15.1 Perfect Partners - Exclusive Q&A with Force India's Simon Roberts. formula1.com (Formula One Administration). 2009-09-29 [2009-12-03]. ^ 16.0 16.1 Strang, Simon. Force India to launch online next week. autosport.com (Haymarket Publications). 2010-02-03 [2010-02-03]. ^ Red Bull Not Switching to RB6 Development... Yet!. autoevolution. [2009-09-21]. ^ Ready to launch? New cars wait in the wings for 2010. formula1.com (Formula One Administration). 2010-01-22 [2010-01-23]. ^ 19.0 19.1 19.2 Elizalde, Pablo. Lotus launches 2010 car in London. autosport.com (Haymarket Publications). 2010-02-12 [2010-02-12]. ^ 20.0 20.1 20.2 Spanish HRT squad launches 2010 car. ITV F1 (ITV Sport). 2010-03-04 [2010-03-04]. （原始内容存档于2010-03-07）. ^ 21.0 21.1 21.2 21.3 21.4 2010 FIA Formula One World Championship Entry List. fia.com (国际汽联). 2009-11-30 [2009-11-30]. （原始内容存档于2009-12-03）. ^ Vodafone McLaren Mercedes signs reigning World Champion Jenson Button to multi-year deal. mclaren.com (Vodafone McLaren Mercedes). 2009-11-18 [2009-11-18]. ^ English, Steven. Paffett to stay on as McLaren tester. autosport.com (Haymarket Publications). 2010-01-16 [2010-01-16]. ^ McLaren extend Hamilton's contract. autosport.com (Haymarket Publications). 2008-01-18 [2009-03-17]. ^ Mercedes takes over Brawn. autosport.com (Haymarket Publications). 2009-11-16 [2009-11-16]. ^ Noble, Jonathan. Schumacher makes F1 return. autosport.com (Haymarket Publications). 2009-12-23 [2009-12-23]. ^ Nick Heidfeld signs for Mercedes GP Petronas. mercedes-gp.com (梅赛德斯車隊網站). 2010-02-04 [2010-02-04]. ^ 31.0 31.1 31.2 31.3 Noble, Jonathan. Ricciardo, Hartley to be Red Bull reserves. autosport.com (Haymarket Publications). 2010-01-26 [2010-01-26]. ^ Beer, Matt. Red Bull to retain Webber for 2010. autosport.com (Haymarket Publications). 2009-07-23 [2009-07-25]. ^ Massa extends Ferrari stay until 2010. Manipe F1. 2007-10-16 [2008-05-20]. （原始内容存档于2010-01-17）. ^ 34.0 34.1 34.2 Drivers. 法拉利車隊. 法拉利. [2010-01-08]. ^ Press release. ferrari.com. 法拉利車隊. 2009-09-30 [2009-09-30]. ^ Williams to use Cosworth engines in 2010. formula1.com (Formula One Administration). 2009-10-30 [2009-10-30]. ^ 37.0 37.1 Williams' 2010 Driver Lineup. WilliamsF1. 2009-11-02 [2009-11-02]. （原始内容存档于2009-11-05）. ^ Beer, Matt. Williams signs Bottas as test driver. autosport.com (Haymarket Publications). 2010-01-29 [2010-01-29]. ^ Strang, Simon. Renault considering KERS for Monza. autosport.com (Haymarket Publications). 2009-08-26 [2009-08-26]. ^ Kubica to join Renault for 2010. BBC Sport (BBC). 2009-10-07 [2009-10-07]. ^ 41.0 41.1 41.2 Beer, Matt. Tung leads Renault reserve line-up. autosport.com (Haymarket Publishing). 2010-01-31 [2010-01-31]. ^ Elizalde, Pablo. Renault reveals the R30, confirms Petrov. autosport.com (Haymarket Publications). 2010-01-31 [2010-01-31]. ^ 43.0 43.1 Elizalde, Pablo. Sutil and Liuzzi confirmed for Force India. autosport.com (Haymarket Publications). 2009-11-27 [2009-11-27]. ^ Goodlad, Phil. Paul di Resta to become Force India test driver. BBC Sport (BBC). 2010-02-02 [2010-02-02]. ^ Buemi to stay on with Toro Rosso. BBC Sport (BBC). 2009-11-09 [2009-11-09]. ^ Elizalde, Pablo. Alguersuari confirmed at Toro Rosso. autosport.com (Haymarket Publications). 2010-01-22 [2010-01-22]. 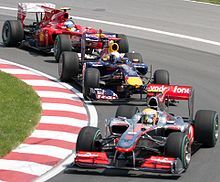 ^ Lotus confirmed, as FIA pushes for 14 teams in 2010. formula1.com (Formula One Administration). 2009-09-15 [2009-09-15]. ^ 48.0 48.1 48.2 Trulli, Kovalainen confirmed at Lotus. autosport.com (Haymarket Publications). 2009-12-14 [2009-12-14]. ^ 49.0 49.1 Newcomers Campos rebranded as Hispania Racing F1 Team. BBC Sport (BBC). 2010-03-03 [2010-03-03]. ^ Noble, Jonathan. Chandhok announced as HRT driver. autosport.com (Haymarket Publications). 2010-03-04 [2010-03-04]. ^ Elizalde, Pablo. Yamamoto replaces Chandhok at HRT. autosport.com (Haymarket Publications). 2010-07-16 [2010-07-16]. ^ Collantine, Keith. Klien takes Yamamoto’s place at HRT. F1 Fanatic (Keith Collantine). 2010-09-24 [2010-09-24]. ^ Beer, Matt. Yamamoto gets Hispania test deal. Autosport.com (Haymarket Publications). 2010-04-17 [2010-04-17]. ^ Beer, Matt. Klien gets Hispania reserve seat. autosport.com (Haymarket Publications). 2010-05-05 [2010-05-05]. ^ Noble, Jonathan. Campos honoured to give Senna F1 slot. autosport.com (Haymarket Publications). 2009-10-31 [2009-10-31]. ^ Yamamoto to replace Senna in Britain. Autosport.com. Haymarket Publications. 2010-07-08 [2010-07-08]. ^ 57.0 57.1 Noble, Jonathan. Sauber secures 2010 Formula 1 slot. autosport.com (Haymarket Publications). 2009-12-03 [2009-12-03]. ^ Pedro de la Rosa to race for BMW Sauber F1 Team. BMW Sauber. 2010-01-19 [2010-01-19]. （原始内容存档于2010-01-23）. ^ Cooper, Adam. Sauber confirms Heidfeld in, de la Rosa out. Adam Cooper's F1 Blog. Adam Cooper. 2010-09-14 [2010-09-14]. ^ Sauber F1 team recruit Japan's Kamui Kobayashi. BBC Sport (BBC). 2009-12-16 [2009-12-16]. ^ World Motorsport Council. Fédération Internationale de l'Automobile. 2009-06-24 [2009-09-17]. （原始内容存档于2010-01-06）. ^ Glock to lead new Manor F1 team. BBC Sport (BBC). 2009-11-17 [2009-11-17]. ^ Virgin Racing announces Andy Soucek as test driver for 2010 season. formula1.com (Formula One Administration). 2010-02-23 [2010-02-23]. ^ Elizalde, Pablo; Glendenning, Mark. Parente, Razia join Virgin as testers. autosport.com (Haymarket Publications). 2009-12-15 [2009-12-15]. ^ Noble, Jonathan. Virgin set to retain Glock, di Grassi. autosport.com (Haymarket Publications). 2010-09-11 [2010-09-11]. ^ Noble, Jonathan. Di Grassi to partner Glock at Virgin. autosport.com (Haymarket Publications). 2009-12-15 [2009-12-15]. ^ Benson, Andrew. Renault will race in Formula 1 after selling their team. BBC Sport (BBC). 2009-12-16 [2009-12-16]. ^ FIA审批通过2010F1赛程 韩国在列阿布扎比再次收官. 2009年12月11日 （中文）. ^ World Motor Sport Council, 11/12/2009. fia.com (Fédération Internationale de l'Automobile). 2009-12-11 [2009-12-11]. ^ 银石获F1英国站17年承办权 大奖赛发源地经典延续. 2009年12月7日 （中文）. ^ Team US confirm 2010 Formula 1 entry. CNN.com. CNN. 2009-05-23 [2009-05-25]. ^ Noble, Jonathan; Rencken, Dieter. US F1 confirms 2010 entry submitted. autosport.com (Haymarket Publications). 2009-05-23 [2009-06-01]. ^ Anderson, Windsor: US car could be on track by November. formula1.com (Formula One Administration). 2009-05-14. ^ English, Steven. American team planning F1 entry. autosport.com (Haymarket Publications). 2009-02-04 [2009-02-04]. ^ Noble, Jonathan. Raikkonen to take a sabbatical in 2010. autosport.com (Haymarket Publications). 2009-11-18 [2009-11-18]. ^ Beer, Matt. Raikkonen joins WRC with Citroen. autosport.com (Haymarket Publications). 2009-12-04 [2009-12-04]. ^ Collantine, Keith. Klien takes Yamamoto’s place at HRT again. F1 Fanatic (Keith Collantine). 2010-11-04 [2010-11-05]. ^ Elizalde, Pablo. Refuelling ban confirmed for next season. autosport.com. Haymarket Publications. 2009-04-30 [2009-04-30]. ^ F1新积分系统获得通过 前十得分制2010正式付诸实施. 2009年12月11日 （中文）. ^ 2010F1规则微调：准许替补车手试车 风洞测试仅六天. 2009年12月17日 （中文）. ^ Straw, Edd. FIA confirms £40m budget cap for 2010. autosport.com (Haymarket Publications). 2009-04-30 [2009-04-30]. ^ Lydell, Phil. Red Bull civil war playing into Button and Hamilton's hands at McLaren. Sportingo. 2010-07-12 [2010-07-13]. （原始内容存档于2010-12-31）.